I have a First-class BA (Hons) in Scriptwriting for Film and Television, which is a real thing that you’re actually allowed to study in modern life (what a world). I have written everything from script treatments to series bibles, and every sensible length of screenplay in between, from short films to feature-lengths. If you’d like to learn more about my scripts, please contact me. A feature-length comedy film about Donald, a quantum physicist in the midst of an existential crisis, and all the usual inconvenience and confusion that comes to day-to-day life when identical clones of yourself start turning up at your house every day and instantly dying upon eye contact. A feature-length CGI comedy adventure that promises to take (im)mature audiences on a microscopic tale of epic proportions. An animation concept for young children about a giant called Burr who gets increasingly little the further he goes from home. This nice bald man is my friend. Sometimes we write things together, for fun, or money, or both, or neither. 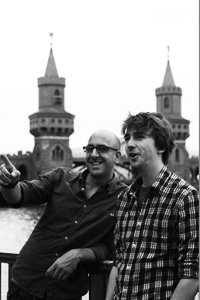 We’ve even co-authored a comedy book together about the best German words and phrases that the English language should adopt, which you can buy here. This website contains big, wacky ideas and little, silly jokes. If you are afraid of either, I suggest you buy a cat and stay indoors. ‘Separation’ is just an illusion, my child. Why not click on these buttons to become One with my website? Hello. I’m Paul, and I’m a comedy writer. The design of my website, however, is intended to suggest a renegade, literary quality, more commonly associated with proper writers.